Have you heard about the Magic Mirror photo booth? It’s available from Face It Photo Booths. This is a modern booth that has a small foot print and looks great. Furthermore, the magic mirror photo booth has an animated start screen. The start screen can be customized to your event. If you would like a quote for your event, please click the “Contact Us” link above for a instant quote. What sets the Magic Mirror photo booth apart from the competition is it’s beauty. Photo booths are by nature klunky and obtrusive, not the Magic Mirror photo booth. The Magic Mirror photo booth has clean lines and a Phantom Of The Opera feel. Mirrors have adorned many film and musical performances since early memories of us all. There is just something magical about a large framed mirror. Combine the magic with touch screen perfection of selfies and short games and perfection is created. We offer custom color lighting on the photo booth as well as a custom animated start screen. The custom frame is included with all packages. We also offer the red carpet treatment as well as a roaming photographer to capture your guests doing random things. If you would like to go all the way, we offer DJ and or karaoke services. 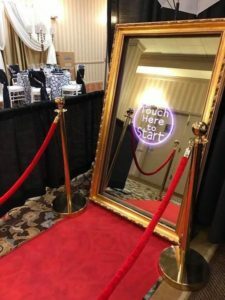 If you are looking for something different, check out our mirror photo booth and see what we can do for your upcoming event. We always do our best to work within your budget. Also, take some time to browse our website and check out our videos of the photo booth along with some of our custom frame work. You may be surprised at what we can do for your upcoming event. Great for weddings, corporate or house parties. Our custom frames are a great take away for your guests. Makes your event unforgettable. ← Photo booth for a birthday party in Houston, TX.